My passion for music has obliterated everything in its path for my entire life. Whenever there was a choice between music and anything else, music won hands down every time. No one person or material thing could ever come close to the feeling I get when the music is right. 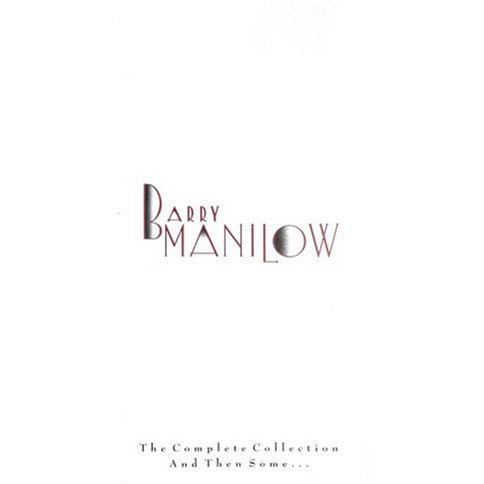 In addition to the four CDs or cassettes, the BOX SET includes a Barry Manilow Performances video, plus a 65-page book featuring an Introduction by Barry Manilow, an essay by Bill Zehme (Senior Writer for Rolling Stone), thoughts from Clive Davis, and “We Write The Songs” (thoughts, feelings and experiences while writing songs included in “The Complete Collection And Then Some…”, by the songwriters). Other photographs courtesy of Linda Allen, Bobby Bank, Peter Borsari, Larry Busacca, The Chicago Tribute Company, Cashbox Magazine, Ann Flood, Greg Gorman, Lee Gurst, Leon Lecash, David Leshay, Jack Hoffman, Michael Jacobs, Robin Platzer, Record World, Matthew Rolston, Jay Thompson, Randee St. Nicholas, The Sunday Mail, US Magazine, and Timothy White, with apologies for any omissions. Special thanks to Melanie Baldwin, Roland Baker, Clive Davis, Beverly Hebelka, Randy Jackson, Mike Kloster, Ken Levy, Roy Lott, Susan Mendola, Carolyn Quan, Milton Sincoff, Carla Sommerstein, Russell Sicklick, Gabriella Tieppo, Leana Wild, Phil Wild, and Joel Whitburn.